People sometimes call Flexible Magnets as rubber magnets which made of ferrite powders and polymer. It has the characteristics of flexible, versatile with endless possibilities. Its material can be twisted, bend, punched, and otherwise made into all forms or shapes without loss of magnetic energy. Due to its flexible characteristic, flexible magnet can be as durable as rubber toys. Flexible magnets are extensively applied for advertising, craft magnets, general signage, vehicle signs, promotional signage, decorative displays, general displays, school educational aid, toy, motor, industrial etc. You can easily cut flexible magnets with scissors and do screen printing, wide format inkjet printing, and also off-set printing. It’s available in adhesive backing or brightly colored vinyl backing, inkjet photo paper backed. You can use our flexible magnets rolls, magnet sheets and cut them to any custom profiles to fit your needs. Displays; nameplates; sales promotions; printing; message boards; P.O.P. displays; instruction boards; menu boards; craft displays; surface-mount signs; planning boards; floor signs; doodle boards; vehicle signage; architectural signage; display boards; graphics; hand lettering; hot stamping; and posters can all be made into magnetic signs. Printers and sign makers use magnetic signs. JLP manufactures flexible magnetic material and blanks used to create magnetic signs. Our ability to customize the magnetic signs (strength, thickness, surface, shape, etc.) for specific applications and processes; our ability to customize packaging; our superior customer service; and our competitive prices make JLP superior. Magnetic Strips is the easiest and widely available item that you can find anywhere to make your art and craft item into magnetic items just by adding a strips to it. The Magnetic Strips come normally in 60 mil with the option of 0.5″ to 1.5″ width rolls. But not all Magnetic Strips are created equal because the glue or the adhesive is important to determine where it will adhere properly to the time you add the Magnetic Strips on. JLP Company, Inc, is exclusively only use Acrylic base adhesive. It is a pressure sensitive type of adhesive in which the stronger you press the better it adhere. So for anyone that likes to do projects or have an idea wanting to make their project to be able to stick/put up to any metal surface as display etc, Magnetic Strips is an easy economical way to achieve that! Remember not all Magnetic Strips is created equal, if you want to show of your work and don’t want to be embarrassed from the item falling off, than give us a call ! Flexible Magnets and human health! We are literally alive with electromagnetic fields, most obviously those generated by our nervous system. As such, we’re all potentially susceptible to magnetic fields, which create electric currents when they change or we move through them. The intense fields used by medical scanners, which are around 100,000 times stronger than the Earth’s magnetic field, can trigger nausea, dizziness and a metallic taste in the mouth, but these effects are temporary. The effects of more commonly encountered fields are, however, much less clear. Despite decades of claims about links between living in the magnetic fields generated by overhead powerlines and cancer, there’s no compelling evidence for long-term health effects. That said, international guidelines for public exposure to magnetic fields set an upper limit of 40 millitesla – around 1,000 times stronger than the Earth’s magnetic field. Given the explanation above, one can safely say that any flexible magnets, printable magnets, Magnet rolls etc are safe for human body because its pull force are so small. they are basically designed for advertising industry and signages. Depending on the shape, flexible magnets are made by one of two processes–extrusion or calendaring. Extrusion is used to form profile-extruded shapes that have irregular cross-sections, such as ridged magnetic strips. This process squeezes a heated rubber magnetic compound through a die of the desired shape, producing lines of bubble-free, compact magnets. Benefits to flexible magnets are wide versatility and their ability to easily mold around most shapes–at 20 degrees Celsius, they can be coiled into a 0.5” radius before cracking. Working with flexible magnets is plain and simple you can pick up your household scissors since they can be sliced, drilled, punctured, scored, you name it. They are also heat-resistant up to 100 degrees Celsius. 2. Printable, that is backed with vinyl and other substrates. 3. Adhesive form, that is backed with acrylic pressure sensitive adhesive. Flexible magnets come in sheets pre-cut or rolls form. JLP Company, Inc offers plain magnetic sheeting, which is pure, unadulterated magnetic material. 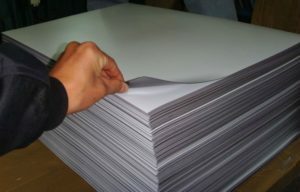 Plain sheets are ideal for printers that have their own equipment and want to affix their own adhesive substrate.